1. What is PAMCo – Audience Measurement for Publishers? PAMCo – Audience Measurement for Publishers is the new audience measurement currency for published media. It produces de-duplicated brand reach allowing users to carry out reach & frequency planning and also plan and trade audiences across all the platforms on which published media content is delivered – phone, tablet, desktop and print. 2. Why is PAMCo an improvement on NRS? PAMCo replaces the National Readership Survey (NRS). NRS was originally designed as a survey to measure print readership, and although over time some digital audience data were integrated via NRS PADD this was not a full solution. With the spectacular growth of mobile audiences it was time to design a new service for the digital world which would include all publisher platforms and enable full utility in planning audiences across those platforms. The thorough industry wide process to find the successor to NRS allowed PAMCo to design such an audience measurement system. This is reflected in a world leading methodology, which is built on the strong base of a large high quality sample of 35,000 face to face interviews with the innovation of a specially designed data feed from Comscore. The development of the PAMCo digital Panel provides measures of duplication of reading across digital and print, the first single-source data of its kind. 3. How does PAMCo measure published media audiences? PAMCo’s world-leading methodology integrates data from three sources to provide a complete view of publisher audiences. A high-quality face to face survey of 35,000 participants per year interviewed in home to collect print readership and demographic data. A new specially developed data file from Comscore, UKOM’s chosen digital audience supplier, which makes it possible to integrate fully ‘phone and tablet audiences as well as pc/laptop audiences. A highly sophisticated data integration methodology has been developed to fuse Comscore’s estimates with the readership/enumeration survey. Duplication of reading between the print and digital platforms is largely captured by the fusion process, with some calibration to match observations from the PAMCo panel. The panel was part of PAMCo’s set-up and validation process and tracked the digital reading behaviour of almost 10,000 survey participants across all their devices for 28 days soon after their PAMCo interview between April 2016 and December 2018. Duplication of reading between the digital platforms is matched to Comscore. 4. How can I access PAMCo data? More detailed analysis can be carried out through computer planning bureaux, such as Kantar Media, Nielsen IMS, Telmar, as well as Mediatel and Touchpoints. There is also an opportunity to obtain direct access to respondent-level data to feed into publisher and agency proprietary tools. For details on how to subscribe to PAMCo data, please see questions 49 & 50. 5. What is PAMCo Ltd? The Publishers Audience Measurement Company (PAMCo) is the governing body which oversees audience measurement for the published media industry. Our funding stakeholders are News Media Association (NMA – representing Newsbrands), Professional Publishers Association (PPA – Magazine Media) and the Institute of Practitioners in Advertising (IPA – Advertising Agencies). The Board also has representation from The Incorporated Society of British Advertisers (ISBA), and a research specialist, currently our research partner, Ipsos MORI. PAMCo Ltd is responsible for the new Joint Industry Currency (JIC) called PAMCo (Audience Measurement for Publishers) in place of NRS data. 6. What is a JIC? Joint Industry Currencies (JICs) are owned by the industry – advertisers, agencies and media owners – to provide transparent and objective audience measurement for each medium. These data are produced and sold at cost, providing both industry accountability and a robust trading currency for each medium. PAMCo is the latest Joint Industry Currency. 7. What has happened to NRS? NRS Ltd handed responsibility for governance to PAMCo Ltd, from January 2016. 8. What is the difference between PAMCo & ABC? PAMCo provides “estimates” of “audiences” to be used for reach and frequency planning, and includes full demographic profiling of who readers are. ABC is the “count” of number of “copies/editions” sold/opened which can be used in planning and trading and offers media owners an independent check of internal reporting systems. 9. What is different about PAMCo? There are differences in both the methodology and the utility of the PAMCo data relative to NRS. In a key development to enable mobile audiences to be included with full utility for planning, Comscore create a special ‘respondent level’ data file for PAMCo. This means data from Comscore respondents can be fused with those of PAMCo respondents. For NRS PADD this was possible for desktop audiences, but not for mobile. This file also provides more granularity than was available previously e.g. separate audience estimates for ‘phones and tablets rather than a combined estimate for ‘mobile’. Another innovation is that between April 2016 and December 2018 10,000 PAMCo participants were recruited to the PAMCo Panel, which involved having their reading behaviour tracked on all devices soon after their interview. This provided single-source data on the duplication of reading the same brand in digital and print, something that had not previously been available. PAMCo uses full colour masthead prompts for the readership questions, including non- date specific front covers for the magazines and newspaper supplements. Questions about print newsbrands ask specifically about weekday and Saturday papers, rather than the ‘6-day’ approach used by NRS. There are changes to the scale used to establish frequency of reading. The PAMCo interview is carried out on a single tablet screen rather than Double Screen CAPI. For more detail on the differences between the NRS and PAMCo surveys and how this might affect the estimates please click here to see the overview of NRS & PAMCo key differences doc. For NRS, reach and frequency planning was only possible for desktop and print platforms. The new methodology also allows for inclusion of audience estimates from new platforms and devices so long as they can be measured on Comscore and Comscore can in turn provide PAMCo with the required respondent level data file for data integration purposes. 10. Why does the PAMCo questionnaire use a brand-first approach? To reflect the reality that many readers now read across both print and digital platforms and so a questionnaire which focuses on print reading and asks about digital reading separately is no longer appropriate. To reduce the potential for confusion between print and digital reading (and possible over-claims for print). To collect claimed readership data for all publisher brands which is then used to provide ‘links’ for the fusion with Comscore digital audience estimates. Claimed digital reading is very different from Comscore estimates, and usually lower, not least because participants will not usually remember all the sites they have visited. There is no intention of publishing the claimed digital behaviour, but it helps to have these data in the background for the data integration process. 11. Why is PAMCo incorporating Comscore’s digital estimates? PAMCo incorporates Comscore’s estimates for digital platforms, rather than issue its own estimates because Published media wish to have a level playing field with all other digital brands in the universe. Buyers have told PAMCo this is critical to enable like for like comparisons and it would be unhelpful for PAMCo to release a different and conflicting set of numbers to those issued by the UKOM approved supplier and de facto industry currency. 12. How does the data integration work? In essence, fusion transfers audience estimates based on participants in one dataset (Comscore in this case) to participants in the host dataset (PAMCo), so that there is a combined dataset. In order to do this, the fusion finds the best possible matches between participants in the respective datasets in respect of their demographics and behaviour. Unlike NRS, PAMCo has been designed for data integration. The questionnaire, for instance, includes more questions to help match the two sets of participants. Another development specifically for PAMCo is that Comscore create a special ‘respondent level’ data file to enable their respondents (i.e. participants) to be matched with PAMCo participants. For NRS PADD this was possible for desktop audiences, but not for mobile. Creating the ‘respondent- level’ file is a complex procedure, as Comscore’s audience estimates are ‘hybrid’ and only partly based on participants. Comscore observes digital behaviour passively via several different and separate panels of participants, but also relies on counts of machine activity (i.e. site/app-centric measurement via tags) to capture all digital activity and model audience estimates. Ipsos must also align the Comscore and PAMCo universes, as there are some differences. You can read more about this in Q.13. Ipsos have developed a number of other procedures to prepare the Comscore data for integration, e.g. filling in some missing demographic data for smaller brands. Data from each source (PAMCo readership survey and Comscore) are fused together based on matching people in terms of demographics and behaviour. 13. Are the PAMCo digital audience estimates the same as those Comscore publish? The data integration procedure is designed to match Comscore’s published estimates as closely as possible. Users will, however, notice some differences due to universe definition. PAMCo’s universe is Great Britain age 15+, while Comscore’s is United Kingdom age 6+ for home desktop/laptop and 18+ for mobile and work desktop/laptop. Ipsos therefore make adjustments to remove those visitors who are either based in Northern Ireland or aged 6-14, and model in estimates for mobile visitors aged 15-17, as well as other procedures necessary to align the PAMCo and Comscore datasets. A tolerance is then set that PAMCo estimates should be within 5% of the target Comscore estimates, though they are usually well within that. 14. Why are the duplications for reading via mobile different between brands in PAMCo compared to NRS PADD? PAMCo has a completely different way of incorporating Comscore’s mobile audience estimates, compared to NRS PADD. The NRS PADD monthly mobile data were created by calibrating the NRS questionnaire claims for mobile readership so that they matched Comscore’s monthly audience levels by brand. So the NRS PADD duplications with the mobile claims for other publisher brands in part came from what existed in the underlying recall data (which are quite different from Comscore anyway) and in part ‘fell out’ as additional respondents were converted to be mobile readers in order to match the Comscore targets. There was no practical way of controlling mobile duplications with other publisher brands. 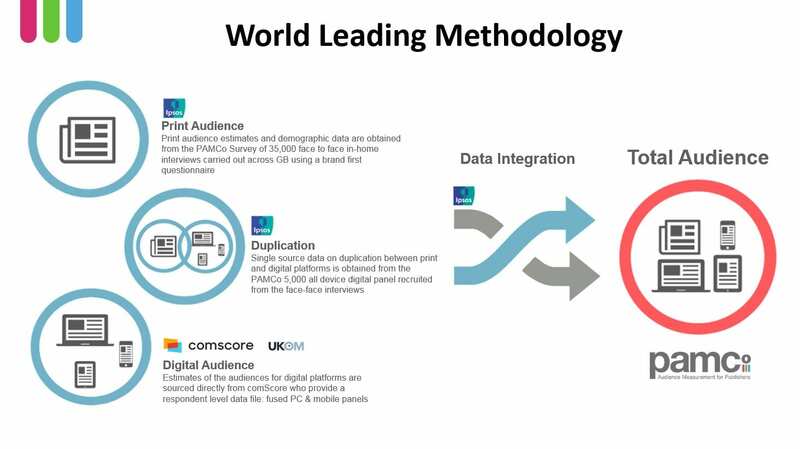 The PAMCo methodology uses a fusion with a specially created respondent level data file from Comscore which includes audience data for all digital platforms including ‘phone and tablet. The duplication between reading different brands on digital platforms reflect those in the data file supplied by Comscore. 15. Why are there some differences when I compare duplications between brands in the original Comscore data with the duplications between brands on digital platforms in PAMCo? The complexity of the Comscore respondent level file means that it is not possible for Comscore to control the duplication in reading between individual brands so that they exactly match what is in Comscore’s own analysis system. There is a tendency for duplications between brands to be somewhat overstated in the PAMCo dataset. It is not possible to resolve this issue for individual brands, however the PAMCo Technical Group decided to use ready calculated ‘Alt Roll-ups’ to define newsbrands and magazines sector reach for marketing purposes from PAMCo 4 2018 onwards, noting there would be a discontinuity with PAMCo 1-3 2018. Alt Roll-ups are bespoke nets of brands of interest, created specifically for PAMCo by Comscore. Alt Roll-ups have been recommended by Comscore as the best guide to estimates of duplication between digital brands. 16. Are the PAMCo audience numbers comparable to NRS estimates? No, the audience estimates are not directly comparable with NRS. There are many changes which mean that it is not possible to make direct comparisons for commercial purposes, and the PAMCo data are in effect a brand-new dataset. For instance, changes to the readership questions include the introduction of a ‘brand-first’ questionnaire structure. Although the audience estimates for digital platforms are still sourced from Comscore, as they were for NRS PADD, overall estimates of brand reach may change somewhat as estimates of the duplication of reading in print and digital are derived from PAMCo’s digital panel. Due to the different methodologies, the PAMCo Board has mandated that NRS and PAMCo data should not be compared for commercial or marketing purposes. This means that from Q1 2017 data release onwards the data should not be compared with previous periods of NRS data. Also, individual periods should not be broken out to compare NRS and PAMCo data for commercial or marketing purposes. 17. What minimum sample do my entities have to reach to be measured and published? Click here to see the PAMCo Rules for Measurement and Publication. 18. How does PAMCo methodology compare to other readership measurement currencies around the world? Throughout the development of PAMCo, the team have been participating in a number of conferences and discussions where audience measurement surveys around the world share best practice and latest developments. A growing focus on the importance of representing duplication of reading between print and digital. A number of countries are developing tools to measure the latter, though PAMCo set up the first all-device Panel we are aware of. What’s included in the dataset? 19. What is the PAMCo universe? PAMCo represents a universe of adults aged 15+, living in Great Britain. The weighted universe is 53,028,000 adults for 2018. 20. Which platforms are reported? 21. What is Total Brand Reach? Total Brand Reach (TBR) is the measure used in the PAMCo published tables. The definition has been agreed by the PAMCo Board. Related/sub-brands that share the main title branding or url of the parent brand e.g. The Guardian and www.the guardian.com. Related and sub-brands that display the parent branding on the home page of the website/app. Sunday papers that do not share weekday branding (e.g. The Observer), to keep parity with other brands. Non-publisher websites, including store/retailer/membership websites will not be included in TBR definitions but could be part of the overall PAMCo dataset. In the analysis systems provided by the computer bureaux, it is possible to break out the different brands and platforms contributing to TBR, with the exception of third-party platforms which are covered in more detail in Q.22 below. A full list of the brands and platforms included in each TBR estimate is available on the PAMCo website and within the computer bureaux. For more detailed information please click here for our full TBR Rules. 22. Does PAMCo include separate estimates for third party platforms such as FBIA, Google AMP, Snapchat, Apple News, Google newsstand, Daily Hunt? Comscore can include measurements for some of these platforms, currently FBIA, Google AMP, Apple News, Flipboard and Google Newsstand. This requires publishers to make the necessary arrangements with Comscore and have appropriate tagging in place. Traffic via these platforms will then be included in their overall digital estimates within PAMCo. However, due to the way data relating to third-party platforms are collected, Comscore are not able to supply Ipsos with the ‘respondent-level data’ which would be required to break out estimates for third-party platforms in the PAMCo database. In the interests of transparency, the PAMCo Board have therefore agreed publishers will be asked to identify whether or not their Comscore estimates include traffic from third-party platforms. This is indicated by a symbol D contained in the name of the publication so it is immediately visible to users when using any analysis system or published tables. It remains a key development objective to be able to break out third-party platform estimates within the PAMCo dataset, so that their contribution to the overall digital estimate is clear and users have maximum flexibility as to which platforms to plan on. PAMCo and Ipsos will be working with Comscore and the other industry bodies concerned towards this end. 23. What is in the PAMCO Questionnaire? *The four PAMCo frequency codes (Almost Always, Quite Often, Occasionally, Less Often) will be published via the bureaux, but ‘Occasionally’ and ‘Less Often’ will continue to be merged and reported as ‘Only Occasionally’ in top line reports. 24. What is Average Issue Readership? For daily newsbrands AIR is available for Saturday editions, as well as an estimate for the 5-day weekday edition, and an overall 6-day estimate. 25. What data are included about digital readers? Content sections (where published by Comscore, usually for the newsbrands). It will be possible to analyse these digital sections individually and by 11 content categories: News, Homepage, Sport, Lifestyle, Arts & Entertainments, Personal Finance, Business, Science & Technology, Travel, Jobs/Careers, and Motors). 26. What is Comscore’s definition of a visitor? 27. What is the PAMCo analysis base? Please note that as the print and digital data integration is carried out based on the full 12-month dataset, digital data and combined print and digital data should only be analysed on a 12-month base, even if the print title is large enough to be analysed on a six-month base. The integration of digital data is not controlled on a six-month base, or for any time period other than the full 12 months. 28. How is duplication between reading in print and on screen controlled? Duplication of reading is largely a product of the fusion process, with a final calibration to targets derived from data collected from the PAMCo Panel. 29. What is the PAMCo Panel? The PAMCo Panel was set-up to provide single-source data on the proportion of readers reading publisher brands in both print and digital. This was a major innovation in the PAMCo set-up, as such data had not previously been available at scale, and there was no reliable benchmark for duplication levels. Around 5,000 survey participants per annum agreed to have a tracker app installed on all their digital devices to track their reading of publisher brands for 28 days, following on as soon as possible after their PAMCo readership interview. Panel recruitment commenced in April 2016 and ran until December 2018, during which time almost 10,000 panellists had their digital reading behaviour tracked. 30. Why did Panel data collection not continue? The Panel data confirmed that the fusion Ipsos carry out to integrate Comscore’s digital audience estimates with print readership estimates from the PAMCo survey is highly successful in capturing duplication of reading between print and digital. In most cases adjustments to match the ‘duplication targets’ generated by the PAMCo Panel result in monthly brand reach which is within -/+2% of that which would be estimated by fusion alone. As such, the Panel validated the fusion process and it was decided by the PAMCo Board and Technical Group to cease Panel data collection with effect from January 2019. Adjustments to print and digital duplication levels by brand continue to be made based on the Panel data, and in time may be supplemented by a modelling procedure to take account of trends if necessary. There is no discernible change in the PAMCo data as a result of ceasing Panel data collection. 31. How are the Panel data used? The Panel data indicate how much more likely print readers are than non-print readers to visit digital platforms of the brand concerned. For some brands there is very little difference between print readers and non-print readers, for others there is a much stronger relationship, with print readers being much more likely than non-print readers to visit digital platforms for that brand. This information is used to set a target print and digital duplication for each brand, which must take into account both the information from the Panel and the size of the Comscore digital audience estimate. Duplication targets are set at a monthly level, and initially for digital reading as a whole (though the allocation process takes into account the various different digital platforms). The target duplications derived from the Panel data are used to adjust the print and digital reading duplications in the fused dataset and ensure duplication is represented fully. For the largest brands these adjustments tend to be minimal, as the fusion is already capturing most of the expected duplication. For smaller brands around 20-30% extra duplication (relative to the fusion alone) is added in, but even in these cases the effect on total monthly brand reach is small. 32. Was a sample size of 5,000 enough to generate duplication targets for the smaller brands? A smoothing approach is used which is variable by sample size. For large sample brands smoothing is minimal, while small sample brands have more smoothing applied to their targets, to avoid volatility. The smoothing model also draws on claimed duplication data from the PAMCo print survey to help predict duplication targets for brands for which there is insufficient panel sample (though it would not be appropriate to take these data at face-value due to the biases and understatement in what participants claim they have read on screen). 33. Why are the duplication targets calculated, rather than taken directly from the Panel? To take account of different levels of readership in the fused PAMCo/Comscore database compared the PAMCo Panel, e.g. if the Comscore estimate is bigger than the digital reach observed in the Panel, which is often the case. To take account of sample sizes which are too small to produce reliable duplication estimates. 34. How representative is the Panel? The Panel was recruited directly from the high-quality PAMCo sample, with every effort made to encourage participation. The requirement was to measure visits to publisher sites across all the participant’s devices, rather than a single device, which would be much easier to achieve. As such, the Panel quality is high relative to the more usual ‘opt-in’ sample used for digital measurement panels. As with most samples, there are some skews in the unweighted sample. The most noticeable is to somewhat under-represent those with 3+ devices, and a tendency to under- represent men and over- represent women. The Panel data are therefore weighted by gender and age, newspaper and magazine readership (to ensure print readers are not over-represented) and 4-week print readership and device usage, to correct these skews as far as possible. Reading via work computers is not included. It is not possible to achieve the necessary permissions to provide a representative sample of reading at work for PAMCo’s purposes. Reading via third-party platforms is not included, other than for Google AMP if the correct tags are in place. The Tracker App cannot identify if different people are using a single device, particularly as it is designed to be as non-intrusive as possible. Only primary users of phones and tablets will have their reading measured, which helps reduce the likelihood of shared usage. While in some cases there will be some overstatement of digital repertoire, the claimed usage data suggest relatively low levels of shared usage. The PAMCo Technical Group conducted an assessment of the data provided by the Panel, which are credible in terms of relationships between the print and digital platforms, and between different types of brand and content. 35. Are PAMCo likely to need to set-up another Panel to measure duplication of reading between print and digital if digital reading behaviour changes over time? A key factor determining the proportion of duplication in reading between print and digital is the relative size of the platforms, which are tracked by the ongoing audience measurement of PAMCo and Comscore. For instance, if audiences reading via pcs drop this will be measured by Comscore, and when these new Comscore pc audience data are incorporated within PAMCo the fusion will reflect a lower proportion of print readers reading via pc. It is possible that there could be more structural changes in duplication over time, though this requires major and sustained change. If, for example, the digital audience for a brand experiences a large and sustained increase, it may be that the ‘new’ digital readers are less likely to read in print than the longstanding digital readers. The possibility of structural change will be checked by monitoring the overlaps in the claimed survey data. Claimed data are not a good guide to absolute levels of duplication, but will give an indication if there are significant trends which need to be taken into account. Ipsos will also be monitoring the amount of calibration in the fused dataset, as an observed increase may indicate underlying change. If there are indications of fundamental underlying change the plan is to extend the use of claimed survey data in the duplication modelling process, where it already plays a role. 36. Can I set up favourite runs/cross tabs and use them each time there is a new data release (i.e. from NRS to PAMCo and each release after PAMCo launches)? Any favourite/regular runs saved within the NRS dataset will not be able to be carried forward to the new PAMCo dataset. However, once the runs on the PAMCo data are set up they can then be carried forward for each future PAMCo release. 37. When will I be able to trend my data? Due to the different methodologies between NRS and PAMCo data the PAMCo Board have mandated that they should not be compared for marketing and commercial purposes. From the PAMCo 1 2019 data release it is possible to compare and trend PAMCo datasets. 38. Can I run my analysis on a base other than 12 months? PAMCo publishes data every quarter based on the most recent rolling 12 months of survey data available e.g. PAMCo January 2018 – December 2018. For larger titles it is possible to look at PRINT readership for periods of less than 12 months, e.g. the most recent six or nine months. However, the minimum sample of average issue readers recommended for such analysis is 100. Analysis of DIGITAL audience data or combined print and digital audience data should ONLY be conducted on a 12 month base. This is because the integration of digital data is carried out using the full 12 months of PAMCo data and is not controlled for any time period other than the full 12 months. 39. Can I look at seasonal trends in the data? As above, PAMCo print readership data can be broken out into particular periods or seasons for analysis, but this is only recommended if the brand has a sample of over 100 average issue readers in the period concerned. 40. Can I do bureaux runs with multiple surveys? This is possible. Please contact your own planning bureaux for details on how to carry this out. 41. Are low sample sizes an issue when analysing the digital data? One of the objectives of PAMCo was to include as many publisher brands as possible in the digital dataset, and if a brand is included data will be shown for all platforms for which Comscore produces data. However, we would caution that users consider the size of the brand concerned when analysing the data in detail. For a relatively small digital brand it would not be recommended to look at daily and weekly audience data; the monthly data will provide a more stable analysis base. Similarly, it will not always be appropriate to carry out detailed analysis for individual platforms (e.g. by specific demographics), particularly tablet which tends to be the smallest of the digital platforms. Unfortunately, it is not possible to give guidance in respect of specific sample sizes, particularly as the Comscore data are only in part based on sample. 42. Why if I manually combine daily and weekly estimates, are they different to the overcodes in the bureaux? In the PAMCo data, whether a person has read or looked at a publication in print or online is expressed in one of two different ways, either as a binary (1/0) variable or as a probability. Traditionally, probabilities have been used as the required input for reach and frequency algorithms and binary data has been used within the cross-tab systems but in the PAMCo dataset (as in its predecessor NRS PADD) probabilities have also been used for some parts of the data within the cross-tab systems because daily and weekly reach in Comscore’s data file take the form of probabilities. Click here for more information. 43. How do I carry out reach and frequency planning? 44. Why is there no print and digital combined code in reach and frequency analysis? There will be a code for the various digital platforms in combination (as well as codes for each of the individual platforms separately). However, as the method of planning print is by insertions and for digital is by page views, it is not possible to combine the two into a single code. Print and digital can be planned in combination in the same schedule, using the separate codes provided for each. 45. Can I produce a plan that is date specific? This is not possible, as the audience estimates are an average across the reporting periods concerned. 46. Can I plan several insertions that appear in different parts of a single edition of print title, e.g. one in the main paper and one in an accompanying supplement on the same day? No, this is not advisable. At the moment the reach and frequency planning facilities within the bureaux assume that if there is more than one insertion in a publication, that these are placed in different editions. The calculations would be misleading if the intention was that the insertions appeared in the same edition, as reach would be overstated. PAMCo will be working with Ipsos and the bureaux to see if it is possible to develop a facility specifically for this type of analysis. 47. Can I optimise my plan across individual platforms? Please contact your respective planning bureaux for information on optimisation tools. 48. If I am a monthly title, can I analyse my daily and weekly print reach as well as monthly reach? Daily, weekly and monthly print reach estimates are provided for all brands in the bureaux planning systems. However care should be taken with sample sizes for the smaller brands. 49. How can I access the data? The topline data are posted on the PAMCo website and are available without subscription. PAMCo & Comscore subscribers have access to the full PAMCo database via one of the computer bureaux (Kantar Media, Nielsen IMS, Telmar, Mediatel) licensed by PAMCo Ltd to provide a data analysis service. It is also possible to obtain direct access to respondent-level data to feed into your own planning tools. Please contact PAMCo Ltd to find out how to do this. To access the full PAMCo dataset you must subscribe to both PAMCo and Comscore. 50. What sort of Comscore subscription do I need to access the digital data? 51. Who can be measured on PAMCo? Any publisher-owned print or digital brand is welcome to apply to have their brand included in PAMCo. For digital brands this is the case, even if there is no corresponding print brand, or the print brand does not have a readership estimate published. There is no minimum circulation requirement for print publications, but a publication must achieve a minimum sample before any data can be released. Click here to see the PAMCo Rules for Measurement and Publication. 52. What if I have a brand that doesn’t have enough sample for publication of a print estimate, or does not have an accompanying print publication, can the digital estimate still be included in the PAMCo dataset? Yes, providing it appears within Comscore. 53. How do I get my brand on PAMCo? Magazine publishers should approach the PPA (Professional Publishers Association) and newsbrand publishers should contact NMA (News Media Association) for further information on how to have their brand measured by PAMCo as part of the PAMCo dataset. 54. How do I add, change or amend my print or digital brands on PAMCo? Publishers who are members of either the NMA or the PPA and who wish make changes to their brands that are currently measured on PAMCo should let PAMCo and their respective industry bodies know. Any changes required to print and/or digital brands included in PAMCo can be requested by publishers when the list of PAMCo entities is circulated by industry bodies on a monthly basis. With regard to digital brands in particular, it is the publisher’s responsibility to inform PAMCo of any changes made to the Comscore Dictionary that have an impact on the entities reported by PAMCo. 55. Do I need to be tagged to have my digital brand included? Tagging is not essential but is strongly recommended in order to achieve the best possible estimates. Comscore reports digital audience estimates even if brands are not tagged, using weighted estimates derived from their panels. These estimates can be integrated within the PAMCo database. However appropriate tagging is highly desirable, as this will improve Comscore’s estimate by ensuring all activity is credited, including activity not covered by Comscore’s panels (e.g. from Android tablets). 56. I need help with tagging my digital property, who do I contact? 57. How do titles qualify to have estimates published? 58. How frequently are PAMCo data published? PAMCo audience estimates will be published on a quarterly basis. 59. When is the next data release? 60. How can I get PAMCo training? PAMCo Client Services is dedicated to helping all of our clients use PAMCo data to its full potential. For detail on our training overview and how to book, please click here.